A weather forecast of thunder storms for the weekend followed by better weather but feeling under the weather myself, meant that I had to re-adjust my plans and delayed my return to Feagour. until the Tuesday. It was 3.30 before I was able to set out in blazing sunshine. The route through the woods and clear-felled plantation is easy on paths and then tracks that lead to the corner of a deer fence. I thought this would be a bit of a problem with not stile or gate in sight but there was a Rohan-sized hole that I was able to squeeze through. 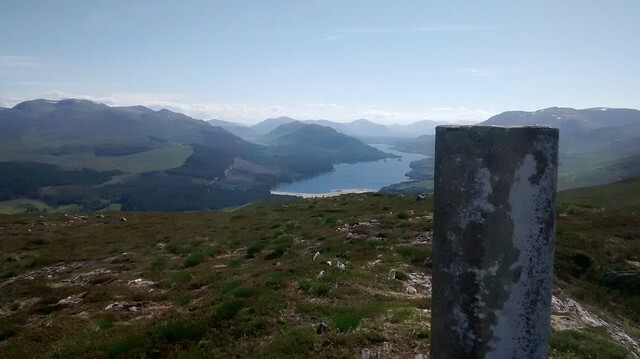 The steepness of the climb, the heat and possibly the after effects of my tummy bug made for slow progress but eventually I was at the trig point with its stunning views down Loch Laggan. I have been on this hill before, fairly recently (March 2016) before I had designs on walking the Watershed. 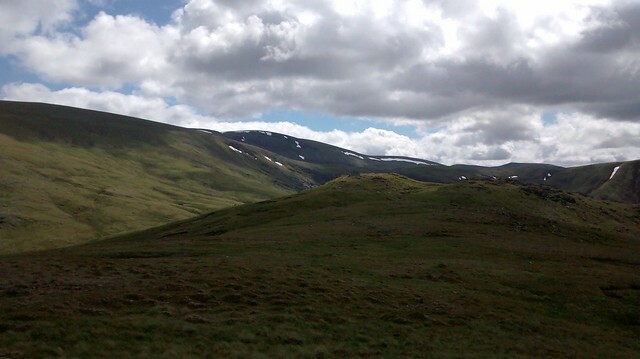 That time I had approached from near Inverpattack Lodge and there was still plenty of snow on the hills. I think I prefer the Watershed route although it is steeper. It took me a slow 90 minutes to reach the trig point on Creag Ruadh. I wasn’t unduly concerned as it was hot and there had been a lot to see in the way. I lingered only to take photos. I remembered this hill as being an excellent view point with views south down Loch Laggan, the Creag Megaidh hills on the right and, on the left, the Binnien Shios and Shuas hills dividing Loch Laggan from Lochan nan Earba above which Creag Pitridh, Geal Charn and Beinn a’ Chlachair rise. 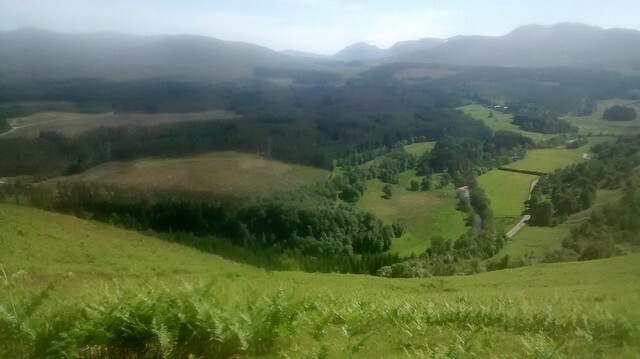 The Beauly-Denny Power line is a slight jar on the senses at this height. Lower, it mars the view down Loch Laggan. Meal Ghoirleig looked a long way off with some low lying, boggy looking ground ahead. 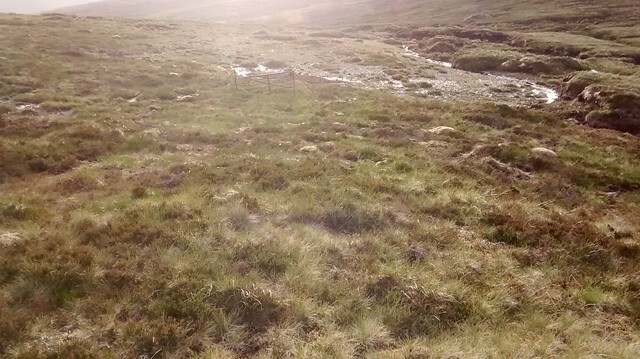 The Watershed picks up a fence line which takes it round Loch na Lairige, just before which a deer fence rudely barges in from the east. I decided not to climb this as the Watershed fence line was only metres the other side and previous experience led me to believe that I would probably have to climb back again fairly shortly. This left me walking along next to the delightful loch. I had started late, I wanted to get a few miles under my belt but I could not resist the temptation of a swim. This loch had a stony bottom and was deep enough for a proper swim which was bliss. It was a bit warmer than I am used to but nevertheless refreshing after the steep climb. Continuing the descent with the wonderful views west, I occasionally came across dried up streams. 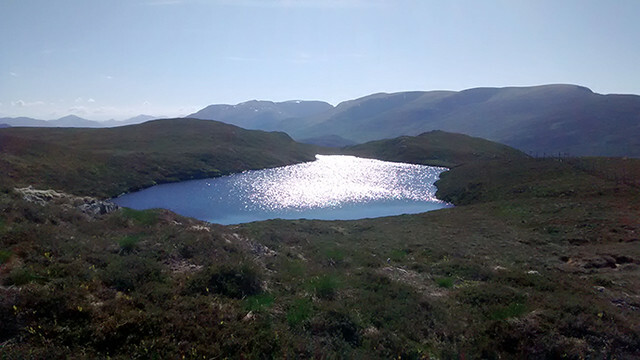 The outlet from Loch na Lairige was nothing more than a dribble and although it meant a lot of extra weight, I was glad that I had put in 4 litres of water. About half way down my legs turned to jelly and I felt weak and shaky. I stopped for a bite to eat and some water, felt slightly better and continued. 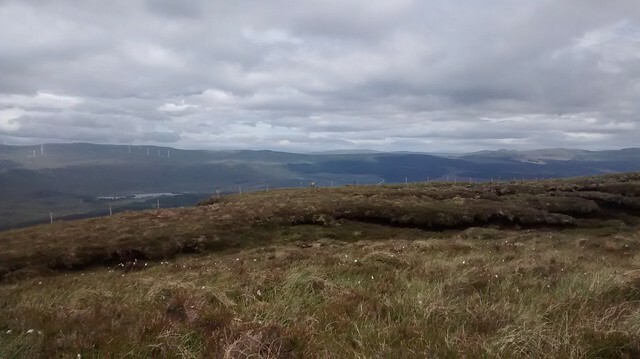 I reached the pylons of the Beauly –Denny line and started across the moor to Ghoirleig. It was heavy going and my energy levels had dropped. 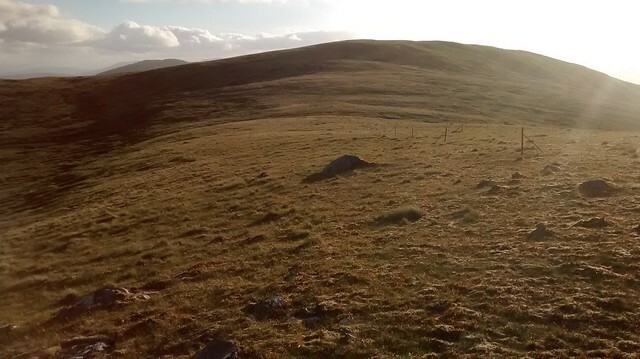 Fortunately, the boggy ground was dry and the watershed kept to a series of rocky outcrops. Sudden stomach cramps told me that my slowness, shaky legs and lethargy were probably the continuing effects of the stomach bug. I didn’t want to camp in this low lying, damp moor. Once the breeze and temperatures dropped, the midges would be out in force. 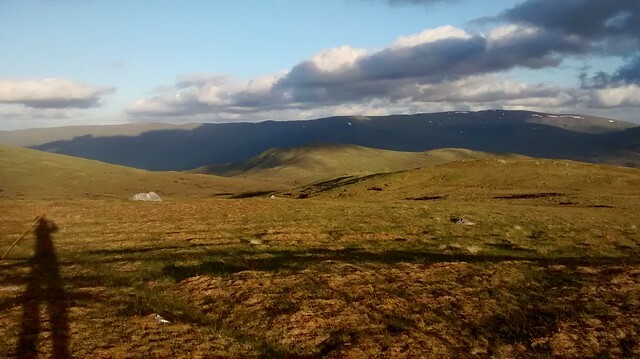 The summit of Ghoirleig wasn’t far off (less than a mile plus about 200m of climb) but I decided that I would return to the van by the track and see how I was in the morning. I made slow progress back to the van, collapsed into bed with no appetite for food and slept until after 08.00 next day. I still didn’t feel great but decided that I would carry a light pack and see how I got on. It took me a while to get going. I parked at the layby at the end of the track that would take me back to Meall Ghoirleig. I had no great ambitions for the day. Carn Liath would be good, Stob Poite Choire Odhar fantastic but I would have a long walk back to the car from the latter. The clamber up Ghoirleig is more interesting than its summit. There is a mix of rowan and birch on the slope, a profusion of wild flowers, blaeberry and heather. Small heath butterflies and plenty of day flying moths flit about. 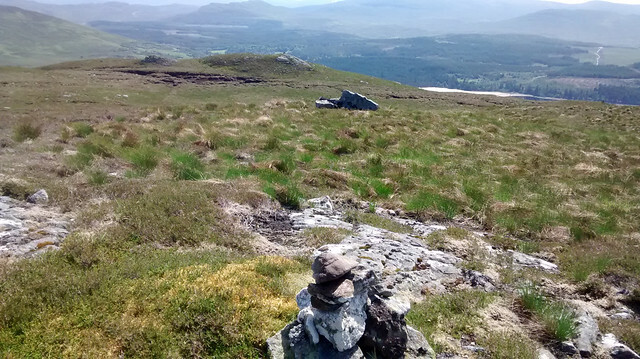 The summit has excellent views but is boggy (albeit dry at the moment) with a confusing number of cairns, the smallest being on the highest point. I am pleased to have got this far but realise that I will reach the highest climb of the day at the hottest time of the day. So far it has been wall to wall sunshine, blue skies and only a slight breeze. The route goes just south of west over another tussocky, boggy tract that has virtually dried up. 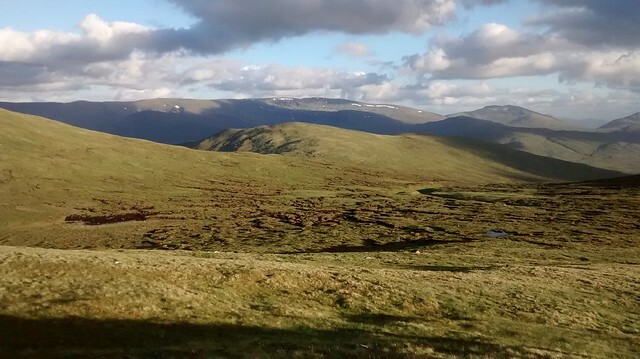 The bog cotton nodded gently in the breeze and the views from yesterday continued with the corries of Stob oire Dubh gleaming a silvery grey in the sunshine. A small stock fence proved surprisingly difficult to cross being just too high to step over and without any nearby strainers. I manage to scratch my leg and dripping blood I renamed Meall Ghoirleig to Meall Goryleg. 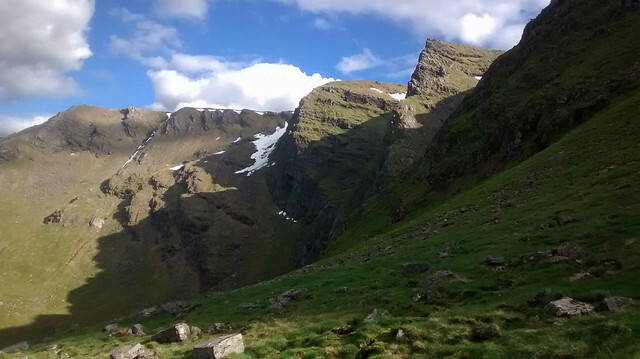 I tried not to think of the heat as I climb the slopes towards Stob Coire Dubh but this is easy as I am enthralled by the amount of wild flowers showing all colours of the rainbow bar orange. I don’t remember seeing so much cranesbill on a mountain before. The flowers of dwarf cornell looked like black headed choir boys with a white ruff of petals stretching up above green cassocks of petals. Milkwort showed in the range from blue to purple. Tall spikes of bluey purple butterwort flowers, Violets also on the violet spectrum, yellow represented by tormentil, primula and bird’s foot trefoil. Alpine lady’s mantle flowers either white or green, take your pick, pink lousewort and pinky white cowberry, red blaebery flowers. Another low growing plant with red “flowers” had me stumped until posting a photo on WH and Skyelines id’d it for me as Salix herbacea (female) common name dwarf willow. I can sing a rainbow, sing a rainbow. I then see sundew and although it hadn’t any flowers, I decide that it represents orange and I can really sing a rainbow. The breeze strengthened and the clouds build. It is still warm but not insufferable and I have stomach pains again but this time not the bug but due to hunger. I haven’t had an appetite since Sunday so this is a good sign and I am feeling so much better. I stop to refuel at the summit of Stob Coire Dubh, marvelling at a whole new vista of mountains that is opened up to the north, not seen before on the watershed. I will keep the ones to the south for this trip but will shortly have to bid farewell to what have become familiar outlines. 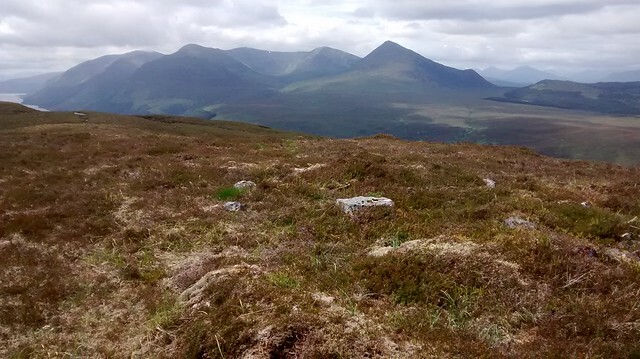 Meanwhile, whilst I can pick out some obvious hills Ben Wyvis and Ben Tee. I note down bearings for others to be worked out at home. There is a pointy one off to the west, surely not Sgurr na Ciche but I couldn’t think what else it could be (Skye?). I should have been certain of this as Dave Hewitt also exclaims over his first sighting of this "jaggy pyramid" but my (faulty) memory of his description had misplaced it onto his climb onto the summit of Ben Tee, sorry Dave! The hard work done, I feel I can relax and enjoy the high level walk to Stob Poite Coire Odhar. No worries about not feeling up to it now. “Don’t Worry about a thing ‘cos everything is going to be alright”. The ground is a mixture of crowberry, cladonia sp lichen and mosses. I see 2 figures heading down from A’Bhuidheanach but they seem to disappear and I assume they have gone down the shoulder. As I approach Coire nan Gall I see a camouflaged clad figure with a long staff looking over the lip of the corrie. I assume he is a local stalker but it turns out that he and his brother (who was videoing over the other side of the shoulder of A’ Bhuidheanach and not encountered) were from Manchester and staying in a cottage on the Ardverikie Estate as they had done each year since seeing Monarch of the Glen. 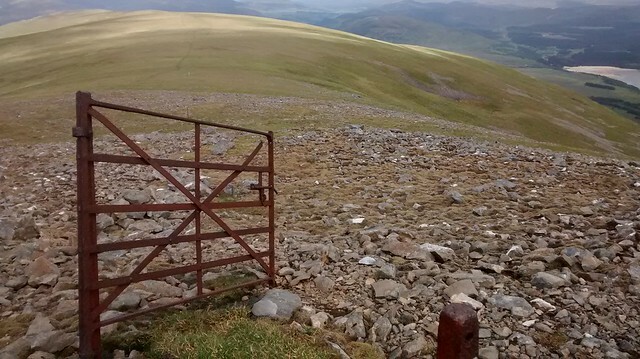 I move on and upwards, marvelling at the amount of redundant gates left behind in the redundant fence, the ground becoming stonier as I approach the summit of Carn Liath. I realise that once again, time has played a dirty trick or rather I had spent too much time chatting and I am going to have to push if I want to get as far as Stob Poite Coire Ardair. 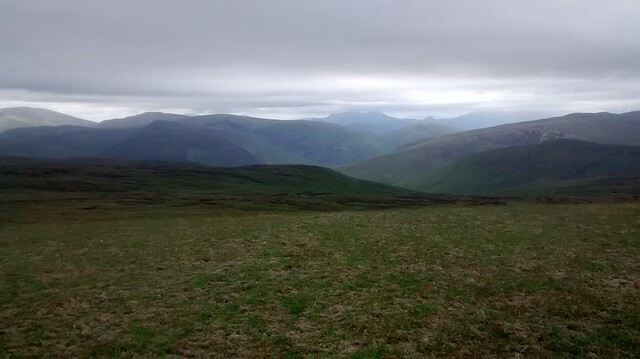 Remembering that I had seriously doubted getting as far as Carn Liath, I made some calculations as I took photos and saw another walker approach. To go down now I could cut across the moor and back to the van, avoiding the road. The ground would probably be rough and difficult. Carrying on, I would take another couple of hours to reach Stob Poite Coire Ardair. The other walker arrived. She was on her last of the day and was with her sister and father. They would be heading down having completed the 3 Munros. I think this influenced my decision to continue. I felt that I had barely started so took the plunge and headed on. The going was easy and views magnificent. Halfway to SPCA I met another walker, a Liverpuddlain. 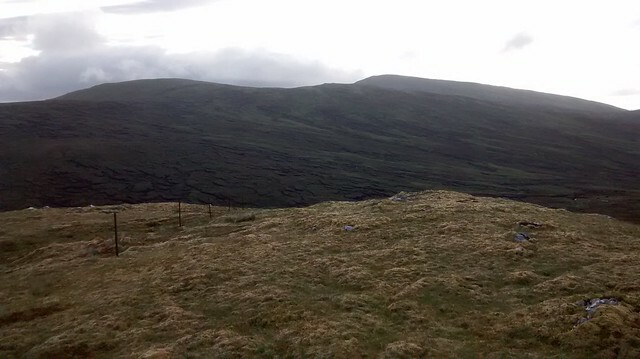 He didn’t think he would go onto Carn Liath because he didn’t realise that he could descend to the carpark from there. I advised that he could and after a few pleasantries we both continued in our opposite directions. I last climbed these 2 hills with Creag Megaidh at the end of May 2001 but I remember it well. 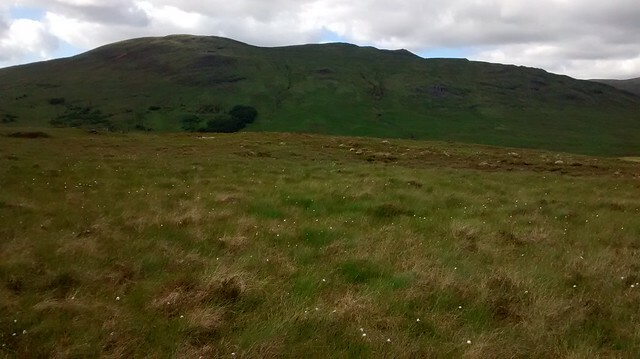 I was much faster (and younger) then and reached SPCA in less the 90 minutes from Carn Liath . Today I managed in 110 minutes so not too bad. Then, we had continued on to Creag Megaidh, today I am descending via The Window, something I have never done before and not something that was not pleasant at this stage of the day. 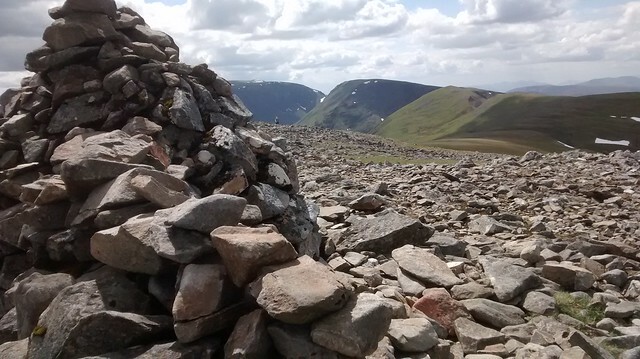 To say it was a bit of a skitter down eroded scree slopes would be an understatement and progress was slow. The corrie still held a good deal of snow and I managed, between slippages, to look up at the impressive cliffs of Megaidh, hanging on to a bunting of snow along the top edge. Once on the path out I made good time down to the carpark. The lower part of the walk is through regenerated woodland and very pleasant with native bluebells edging the path. I wondered how easy it would be to get a lift the 4 miles back to the car. I didn’t have a problem walking it but it is not a pedestrian friendly route along the A86. As I reached the Aberarder buildings I saw a familiar figure ahead. It was the friendly Liverpuddlain. He very kindly agreed to give me a lift to my van. He asked about nearby hotels/hostels. In good faith I told him that there was one about 4-5 miles along the road at the turn off to Dalwhinnie. When I went that way later I realised that the hotel was no, more and they hostel didn’t look as if it was operational any longer. I felt bad and hope that Keith found somewhere. 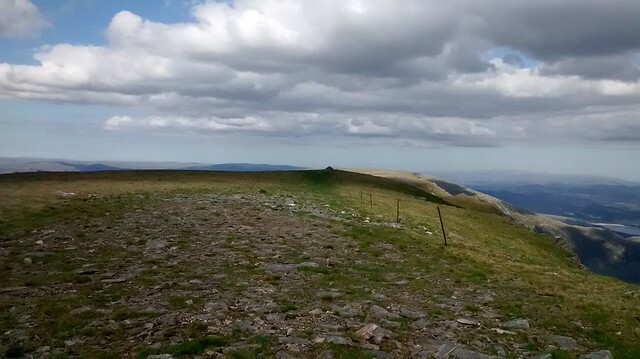 A lovely walking holiday in the Lakes which was a birthday treat from my sister intervened (pleased to have finally climbed Blencathra via Sharp Edge) before I returned to Creag Meagaidh to complete the final stretch to Laggan Locks at the midsummer solstice. I retraced my steps up to the Window, a far more pleasant walk in this direction. I was pleased with my progress and was back on the Watershed in 3 ½ hours.I had been to see my 12 yr old grandson perform Rooster in Balerno High School’s production of Annie the night before. It was an excellent production and needless to say the songs were running through my head. Tomorrow would see me reach the halfway point to Duncansby Head so I sang out “Tomorrow” at the top of my voice. The wind was a bit stronger than comfortable, the temperature a good deal cooler than my last outing and a couple of rain showers passed through but nothing that caused problems and the midges were kept at bay. The descent to Meall Ptarmigan was straightforward. 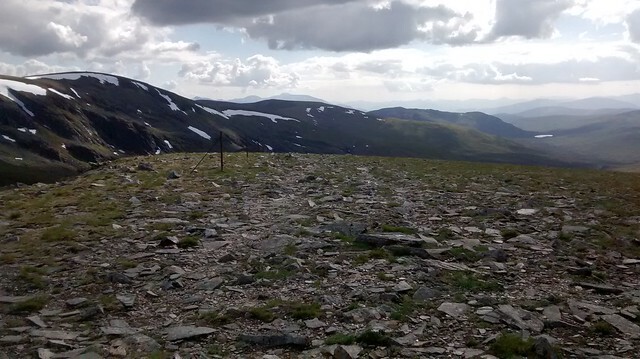 I saw plenty of deer, golden plovers and a pair of dotterels but no ptarmigan. 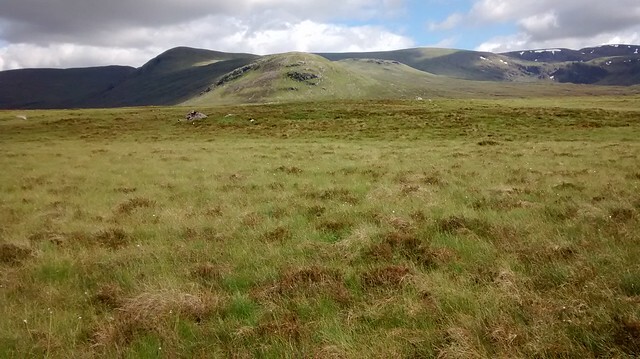 Ahead the flat glen floor with its numerous peat hags looked like it would slow my progress. 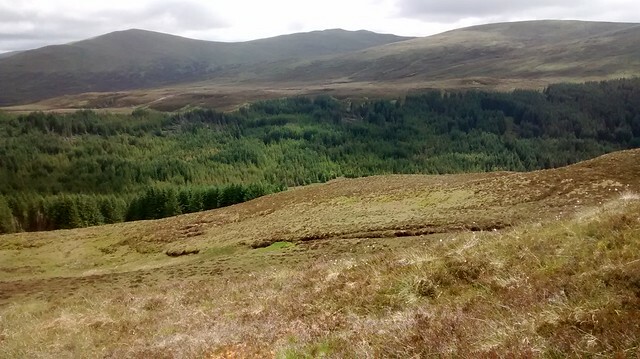 The Watershed route lies between the head waters of the rivers Spey and Roy just over a mile to the east of the Luib Chonnal bothy. 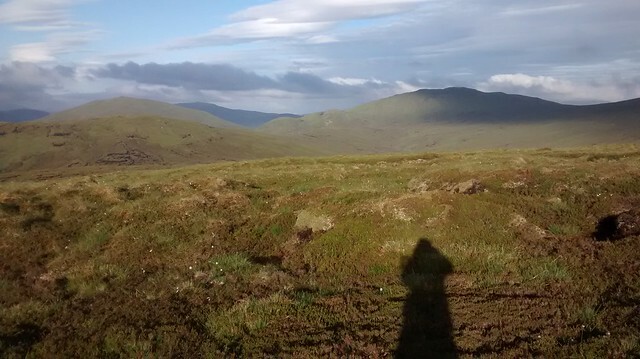 I was tempted to go and dump my bag at the bothy and then have an evening saunter, travelling light over the Watershed to Lec nan Uan but it was midsummer and I wanted to camp outside and up a hill. 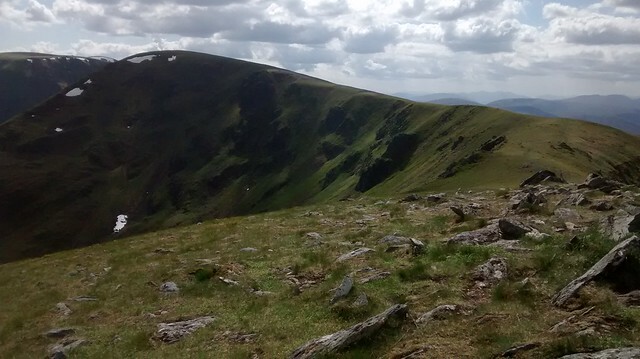 The interminable peat hags of the valley floor were eventually passed and I climbed up to the summit of Craig a’ Chail which I think means hill of the girl. 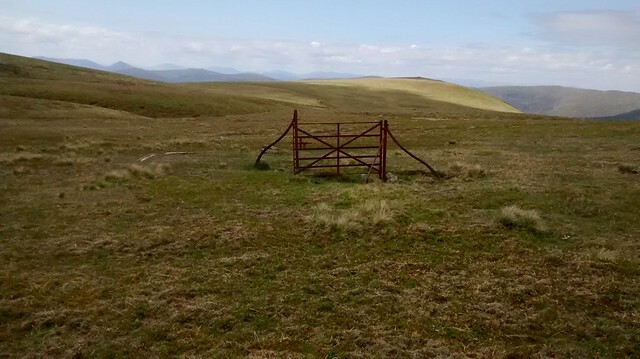 No girls were to be seen but I found another redundant gate on the descent and a slight path associated with the fence posts which were now back. 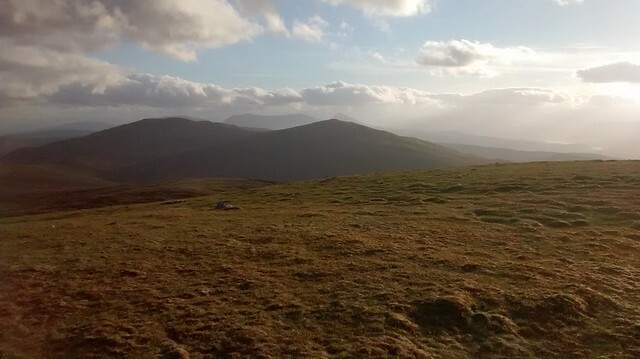 I failed to take photos on the this and succeeding summits until Poll-gormack Hill where I hoped to bivvy for the night. 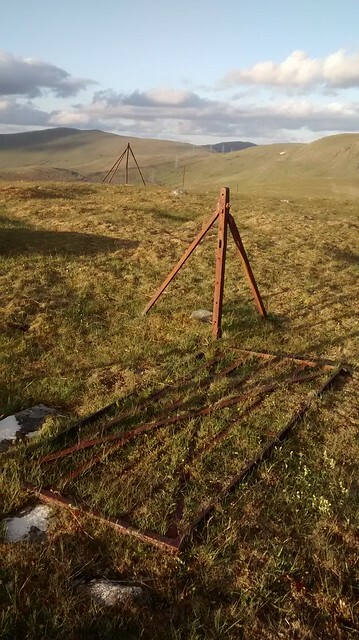 Again there was a redundant gate and the old iron fence posts pointed to the pylons of the Beauly-Denny power lines, marching over the Corrieyairack pass. I reflected that Wade’s road through this historic pass had probably laid the way for the power line and possibly future generations may come to view what I see as ugly pylons as historic artefacts. The cool, strong wind persuaded me onwards but the slopes were deteriorating into more wet, peat hags so I decided to find a dry “island of heather” in the midst of a hag which would give me some protection from the icy wind. I hoped to watch the sun go down on this, the longest day but after eating my evening meal, the cold and tiredness drove me into my sleeping bag and within minutes I was sound asleep and probably snoring. I woke shortly after 5.30 turned over and slept on to just after 6.00. The day was overcast and it was still cold. 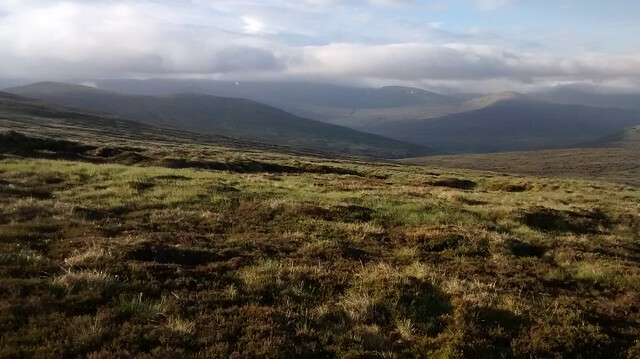 I had about 8 miles to go to the A86 and the bus so I had a leisurely breakfast, eyeing the seemingly un-ending peat hags on the route to Carn Dearg. 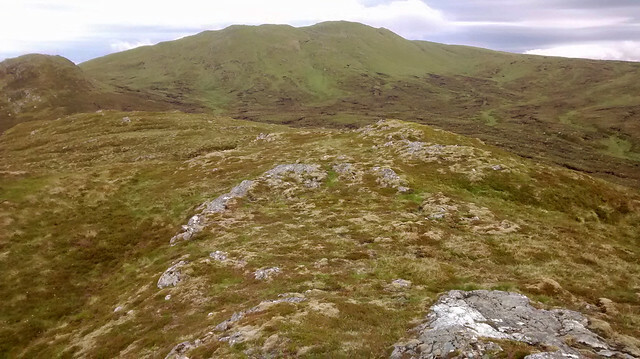 A common hill name with 2 other Corbetts of the same name within 10 km. 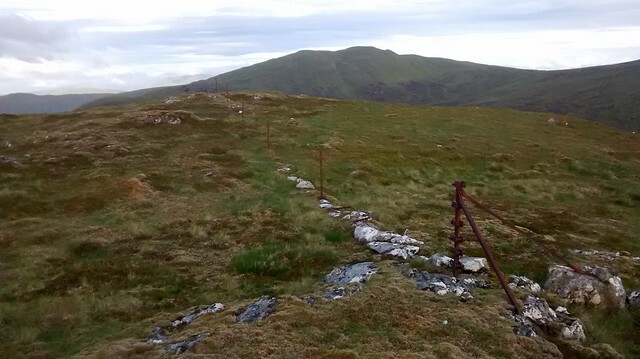 Following the fence line kept me to the driest ground but I made slow progress over Leac nan Uan and the rocky outcrops of Creagan nam Meall before heading up Carn Dearg, my 2nd visit to this inauspicious hill, reaching the summit a slow 2 hours after my start. 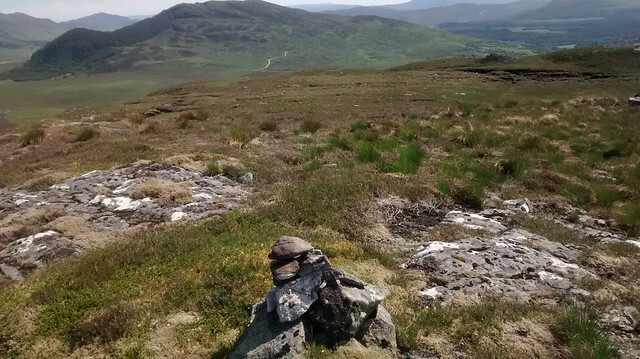 Each summit on the route was rocky but the slopes had peat hags running up their flanks. 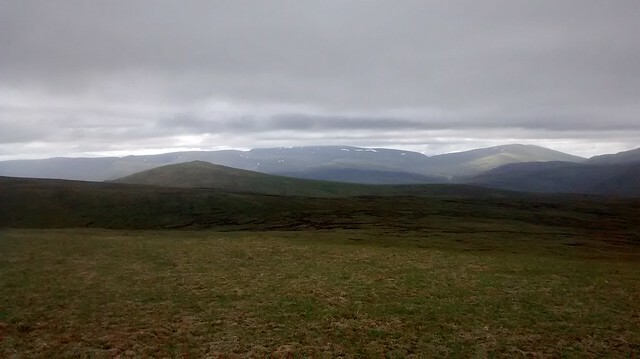 The views were not spectacular with low cloud obscuring the summits. The marks of the famous parallel roads could be made out at the head of Glen Roy but the light was not good enough to capture them on photographs. 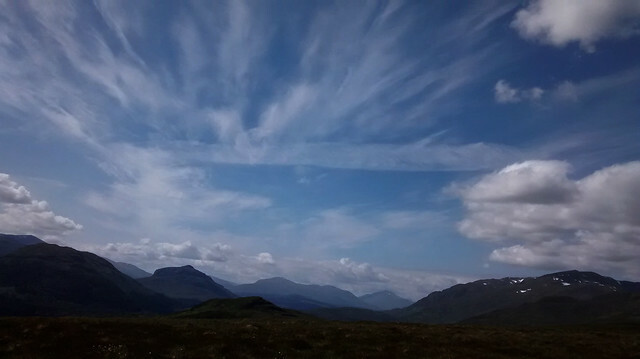 The wind was gentler than yesterday but still enough to keep the day cool and the midges away. Carn na Larach by Seal54, on Flickr. 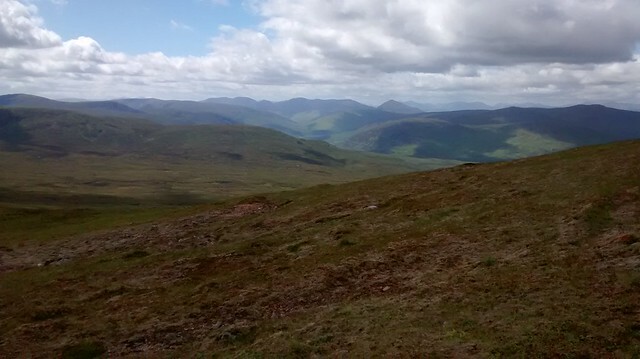 From the summit of Carn na Larach, I picked what looked to be a way through the plantation and then descend by the broad shoulder of Bheinn Bhan. I keep my eyes open for a stile or gate in the deer fence but see none. A landrover made its way up the new track towards and equally new deer fence that crossed my route. 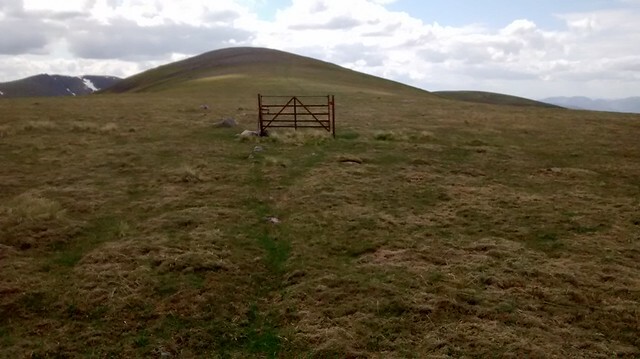 I turned towards where the landrover came to a halt at the end of the track in the hopes that there woul be a stile/gate there. I heard a dog bark but could see no sign of it or the driver or indeed find a way through the fence so climbed over it at a strainer. This was just the first of a number of fence climbs and obstacles over the next 4 miles. Another fence clamber took me to the edge of the plantation and a firebreak right on cue. 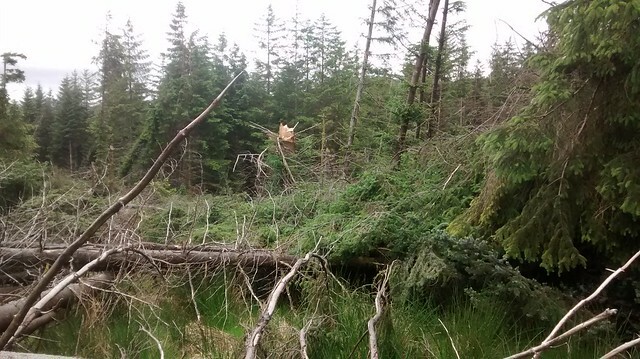 Ten minutes later I am fighting my way through closely packed sitka spruce after getting around a windblown tree. Back on the firebreak I see what I think is a clearing up ahead but it turns out to be a large area of windblown trees. I turn back and walk around the edge of the plantation to another break but again encountered extensive windblown trees. I struggled round the edge of the plantation before being forced back out over the deer fence. I was hot and bothered and when in the trees, attacked by midges. 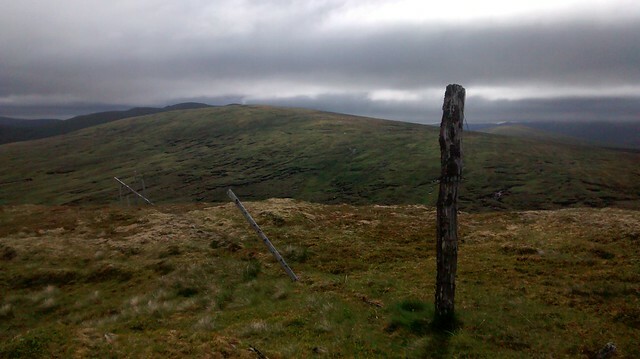 Over the deer fence I joined the new track that took me the short distance to the slopes of Creag nan Gobhar and after a final deer fence climb I reach the summit of this last hill of the “Heartland March” of the Watershed. 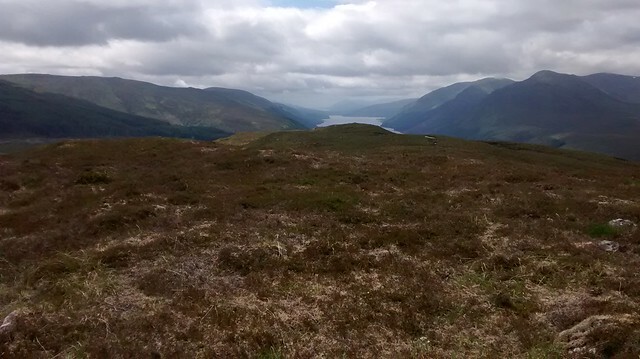 There are fine views along the Great Glen which compensate for the dullness of the day. I had just 2 miles to go but it was clear that I would miss the 14.28 bus even if I followed the forestry tracks below. 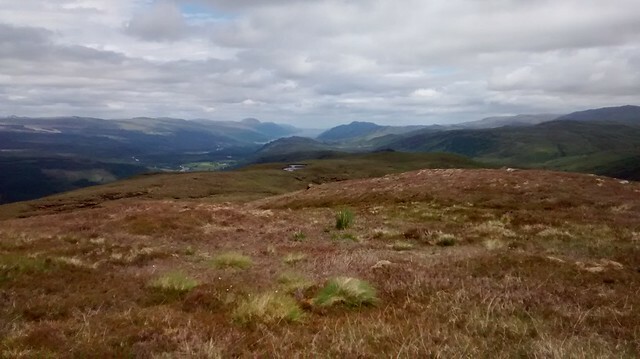 The Watershed follows a firebreak (more or less) and I intended to come out just North of the Great Glen Hostel (formerly the SYHA). Before reaching the forest I had some very tussocky ground to cover. I reflected that I had all my “favourite” terrains on this short stretch of the ‘shed. 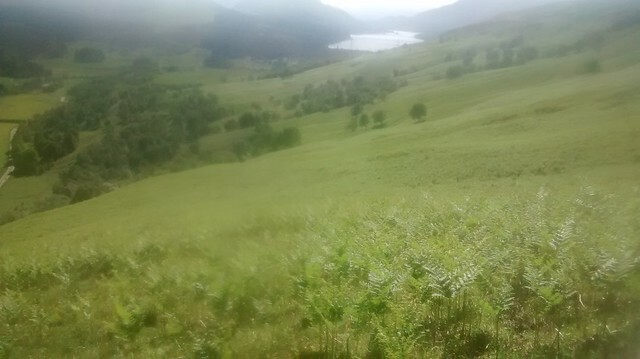 ; Peat hags, deer fences, commercial forestry, windblown trees, tussocks, I was just missing bracken. In fact, I found this day's walk, although getting me to the half way stage of the Watershed, disappointing with very little to recommend it except that it marks the end of another section. I still had to avoid logging operations and eventually gave up on the firebreak as I could see more windblown trees, piled up below me. I followed the forestry out to Laggan Locks. I had 90 minutes before my bus to Spean Bridge. Initially I thought a beer at The Eagle Barge Inn would go down well but as I had to hitch from Spean Bridge back to my van at Creag Megaidh I decided on a soft drink instead. The bus and hitching went well and having joined up with another hitchkhiker on her way to Young Greens weekend meet at Newtonmore, I was able to turn into lift giver at Creag Megaidh and take her to her end point. Last edited by rohan on Thu Jan 17, 2019 10:23 pm, edited 1 time in total. More great stuff - the lyrical description of your walk on the 5th is especially fine. And great to see a sundew - haven't seen any for decades. And now I can look at the pics on your Flickr site, I'm enjoying it doubly. The area around Coire Ardair looks particularly dramatic, and it's one I've planned a route for (bike and walk) but not yet visited. 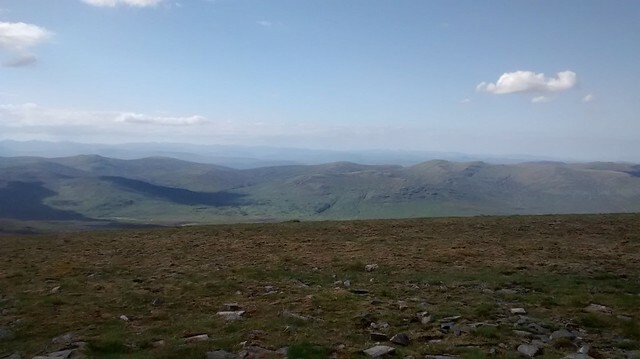 BTW not all the pics in the report seem to be in your Flickr folder (eg Pano from the summit of Carn Dearg)...??? Thanks again for your positive comments. This year was a good year for flowers. 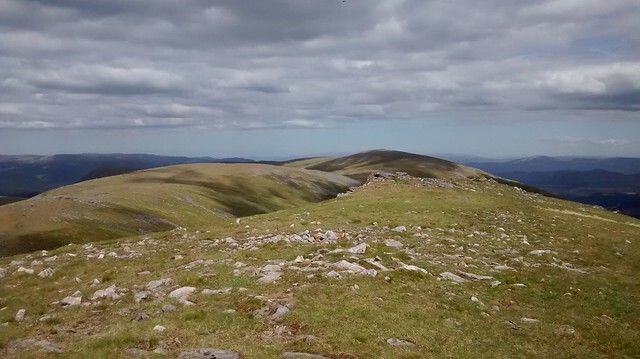 BTW not all the pics in the report seem to be in your Flickr folder (eg Pano from the summit of Carn Dearg)...? Something I am just beginning to discover as I start to the process of swopping these composite photos for my Flickr links. As soon as I sorted my account I uploaded everything as quick as I could and I need to sort the folder out properly. Still with no obvious weather window co-inciding with my available time, I'll not be back to the Watershed for at least a week or possibly 2 so might make progress there. !